There was a discussion on Twitter, which I now can’t find, where people shared their experience with disappointing foods. To my surprise, Turkish Delight kept being mentioned. Many Americans and Brits shared that they were so excited to sink their teeth into a Turksh Delight after its hype in “The Lion, The Witch and The Wardrobe” but were left with disappointment. Since this was such a subjective conversation, I just lurked but I absolutely do not agree. First of all, I firmly stand by what I’ve said in another perfume review before, marshmallows are the most disappointing dessert. Secondly, I realized they were eating sad, stale lokum and judging an entire dessert on sad, stale, store bought treats. Eat a freshly made rose or mastic flavored lokum in Istanbul and tell me it’s disappointing! You can’t. It’s packed with flavor and textures. It’s truly a treat. And apparently I’m not the only person to think this. There are plenty of indie and niche perfumes inspired by Turkish delight. My issue with all of the ones I’ve tried (Serge Lutens, Ava Luxe, Keiko Mecheri) is that they were so sweet. They down-played the florals, the fruits and the resins. It was just like, well, a marshmallow! To my surprise, I’ve found a Turkish delight perfume in an unexpected place. 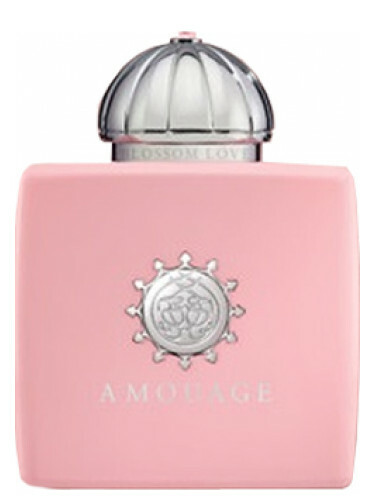 Amouage Blossom Love is a perfume inspired by cherry blossoms. But, I think of it more as a lokum perfume. It’s a sweet, powdery floral that weaves in and out of the gourmand genre. Amouage Blossom opens with a bright but chewy bergamot (which reminds me of bergamot lokum). It’s then maraschino cherry syrup and heady florals. So, yes, it’s like heliotrope. It also has a prominent amaretto accord that is nutty and bittersweet. The cherry, the syrup and the nuts makes me think of Turkish delights/lokum even more than before.The rose is like rosewater. As it wears, it becomes more of a heady floral, like jasmine, but it’s covered in vanilla sugar. In the background there’s a sweet, coumarin-ish pipe tobacco. Basically Amouage Blossom is a chewy, gooey jelly bean-ish cube of flavor covered in sugar. Notes listed include bergamot, heliotrope, amaretto, ylang-ylang, rose, cherry blossom, amber, tonka bean, vanilla and suede. Launched in 2017. Give Amouage Blossom a try if you like powdery, sweet florals. Or perfumes like Initio Addictive Vibration, Xerjoff Al-Khat, L’Artisan Traversee du Bosphore, Serge Lutens Rahat Loukoum, Serge Lutens Louve and/or Keiko Mecheri Loukhoum. The 3.4 oz retails for $360 at Osswald. Samples are also available for purchase. Victoria’s Final EauPINION – Powdery, cherry-almond floral. I know it’s technically a cherry blossom inspired perfume but I get Turkish Delight from it! I like it but, ouch, that price! Ouch !!! That price indeed !!! Yes, I totally agree with you on tasting a freshly made piece of turkish delight. There’s something unusual about alot of these immigrant desserts- and when I say immigrant, I’m one of them. Alot of them are quite simple, but it’s the texture and simple ingredients that really make them unique. Right now I’m in love with a middle eastern semolina cake that is made out of semolina, honey, butter, yogurt, sugar and orange blossom flower, which, much like the rose water in some turkish delight, makes it so fragrant! I also like dousing myself with the orange blossom flower water. Just be careful using it in foods as it is very potent. Anyway, now you have me craving semolina cake like mad. And they’ve gotten so $$$ throughout the years! Typing out their prices always makes me feel like a prehistoric blogger.